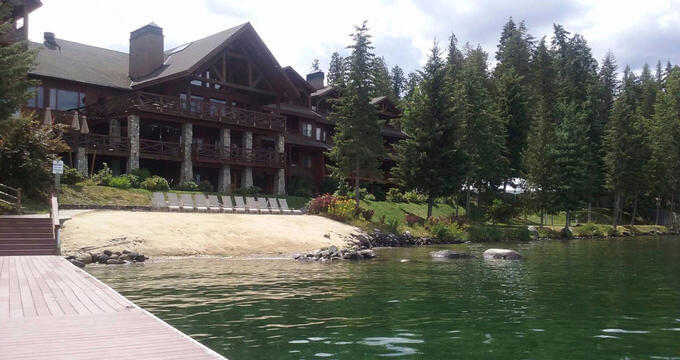 Sagle, Idaho is home to The Lodge at Sandpoint. The Lodge is home to comfortable accommodations with stunning views and a variety of options for outdoor activities and lakefront fun. All of the accommodations at The Lodge are found in one of the many guest rooms or cabins on site. Each guest room features a private bathroom and is located on one of the four floors of the waterfront Lodge property, and was designed to provide views of either the Selkirk Mountains or Lake Pend Oreille. The three cabins are located close to The Lodge. Studio rooms, which are all non-lakefront view, are around 300 square feet. Each has a king size bed with pillowtop mattress and have a maximum occupancy of two guests. Guests can also choose from the Studio 2Q option, which provides two queen size beds in place of the one king size bed. This guest room adds an additional 150 square feet. An additional choice for guests is the Studio Plus, which gives them access to their own, private fireplace and allows for an additional two guests before hitting maximum occupancy. There are multiple Lakeside Studio guest rooms as well - the standard, Lakeside Studio Plus, and Lakeside Two-Bedroom suites. These rooms come with king-size beds (the standard has one, while others have two), outdoor balconies and terraces, and fireplaces. They vary between 425 and 900 square feet in size, and the Two-Bedroom suite has its own full-sized kitchenette. Maximum occupancy is between two and four. There are also three additional, even more, upscale options. Between 900 and 1100 square feet, the Bedroom Suite Plus, Lakeside Suite, and Lakeside Suite Plus provide guests with separate master bedrooms, living room/sitting areas, and dining rooms. They all have private balconies and fireplaces. Each has a maximum occupancy of four. Three guests rooms are considered ADA accessible and include shower handrail and more accessible restroom facilities. A select number of guest rooms also allow pets, which can be up to 40 pounds a piece with a limit of two, for an additional fee per pet. There are three cabins on-site, as well. Cabins one and two are both non-Lakeview and are one bedroom each. Both are fitted with small but functional kitchens, separate bedrooms, and a small living room. Both cabins have a maximum occupancy of four, and small pets are welcome. They have no internet access. Cabin three is two stories with an additional two bedrooms (two with queen size beds and one with two, double size beds). There is a maximum residency of six, and small pets are also welcome here. Cabin three also does not have internet access. Each guest room comes with a variety of amenities for guests to enjoy while staying at The Lodge. All rooms come furnished with a coffee maker that comes with a selection of complimentary coffee and tea options, an in-room ironing board and iron, a hairdryer, cable television, miniature refrigerator, a clock radio, and complimentary internet access (through both wireless and ethernet connections). All guest rooms also come with complimentary, daily housekeeping services. Another amenity at The Lodge is their fitness room. There is also a reading room area that has a fireplace and a variety of different books to choose from and read while enjoying views of the property. Overnight stays at The Lodge allow guests to access the 600 feet of private, waterfront property just outside their front door. There are multiple different lakeside patios and decks for guest use as well. The outdoor property also has numerous hot tubs. There are many different recreational activities at The Lodge - at the lake and on the mountain. Lake Pend Oreille is comprised of more than 100 miles of waterfront, and guests can bring their own boats or rent one from a local business. Jet Skis are also available. Public cruises can be reserved ahead of time too, for guests who enjoy being showed the area by an expert guide. Guests can fish as well. Depending on the season of the visit, both the Selkirk and Schweitzer Mountains have activities for guests to enjoy. In the summer, guests can take a chairlift ride, enjoy mountain biking or hiking, or enjoy bungee jumping at the Power Tower. In the winter, there are many different snow sports to choose from - skiing, snowboarding, and even tubing. Each overnight stay at The Lodge comes with a complimentary continental style breakfast buffet. There are two restaurants also located close by in Sandpoint - Forty-One South and Shoga Sushi Bar. Forty-One South seats 150 people and is located just adjacent to the property. The menu is modern American and is considered full-service fine dining. Shoga Sushi Bar is also close to the property and has both indoor and outdoor seating options for lodge guests. Lunch and dinner are served at the Sushi Bar, and the menu changes seasonally.